Special care for oil-waxed surfaces! Highly effective in the removal of fat, shoe polish, shoe marks, ink and other hard to remove stains. For cleaning and maintaining oiled and waxed wood/cork floors and furniture. 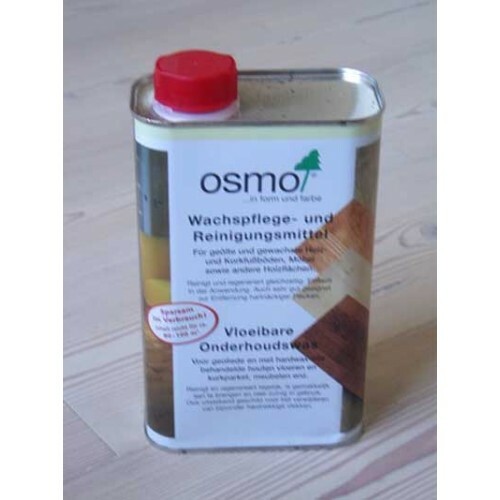 Both cleans and regenerates the wood, as well as providing necessary waxes without building a film layer. Use: Apply the Liquid Wax Cleaner to the surface (approx. 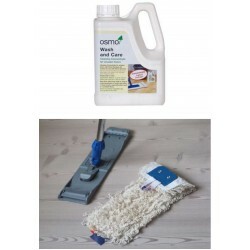 1 cap full per m2), spread and polish using the Osmo active fibre cloth (available with Osmo Opti-Set). 1 litre covers approx. 80-100m2.